Back to School: Military Recruiters Increasingly Targeting High School Teens | Democracy Now! Senior Advocacy Coordinator at the New York Civil Liberties Union, where he works on the organization’s Project on Military Recruitment and Students’ Rights. JUAN GONZALEZ: As millions of students prepare for the start of another school year, we turn to an issue that concerns many parents: the increasing presence of military recruiters in the nation’s high schools and the military’s ability to gather information about students. magazine. His latest article is titled “A Few Good Kids.” He’s also the co-author, with his sister Amy, of three books. We’re also joined by Ari Rosmarin, senior advocacy coordinator at the New York Civil Liberties Union. He works on the organization’s Project on Military Recruitment and Students’ Rights. Welcome to the both of you. I want to start with David. It’s not just No Child Left Behind. You talk in your article about all kinds of other ways that the government has been and the military has been getting information on America’s youth. DAVID GOODMAN: That’s right, Juan. You know, as families and students around the country are about to return to school this week, and New York starts next week, what they may be unaware of is that in the pack — you know, my daughter, who’s in high school, along with every high school student — comes this sheaf of papers that you get in a week or two before. Buried in that sheaf is a letter informing them that all information about every high school junior and senior in the country is being sent to military recruiters by default, unless you happen to notice this letter and choose to opt out. Oddly enough, this letter comes as a result of President George Bush’s signature education law, the No Child Left Behind Act, which in 2002 included a provision, slipped in by then-Representative, now-Senator David Vitter from Louisiana, requiring all high schools to provide directory and contact information to recruiters. It effectively transformed this supposed education law into the most aggressive military recruitment tool that the armed services have had to date. But that, as you point out, is not the only way that information is being gathered. At the same time as the No Child Left Behind law began harvesting this kind of directory information, which the military has not had before — you know, the sight of recruiters at malls and hanging around at high school football games and such has been the more typical scene that we are accustomed to with the all-volunteer Army. They go out, and they try and meet young people wherever they think they’ll hang out. Having emails, cell phone numbers and home phone numbers is a whole new level for, you know, what — how recruiters can access young people. But there’s more. We found out, in 2005 privacy advocates were amazed to discover that the Pentagon had been amassing an extraordinary number of names, at this point 34 million names of young people, which is said to be “the largest repository of 16-25 —year-old youth data in the country” -— those are the military’s own words — in something called the JAMRS database. That’s the Joint Advertising Market Research & Studies program of the Defense Department. This is where all information has now been centralized, from Selective Service to the No Child Left Behind directory info. JUAN GONZALEZ: David, you actually mention one website, marchtosuccess.com, which you say the Army spent $1.2 million backing this, and it supposedly helps to — provides tips to young people on standardized test taking, and only at the very bottom is it mentioned that it’s sponsored by the US military? DAVID GOODMAN: That’s right, marchtosuccess.com is being used by teachers all around the country. They send students to this website, ostensibly to provide them with free standardized test taking tips. And this is designed by the top test prep firms — Kaplan, Princeton Review. Peterson’s is the current contractor providing the information. And yet, this is in fact a website run by the Army. You wouldn’t know that unless you notice the little tagline in the lower right corner that links to goarmy.com, which is the Army recruiting website. And by the Army’s own words to me, one of their most effective recruiting vehicles is goarmy.com. So, you know, the director of the program told me that — of the marchtosuccess.com, said that “We’re providing a great service to schools that normally would cost them.” But what he doesn’t say is that this marchtosuccess.com is currently registering an average of 17,000 new users each month, and you can elect to have a recruiter monitor your test progress. This is not a teacher; this is an Army recruiter, who can coach you along and then presumably help you when it comes to make decisions that obviously a recruiter hopes will land you in the armed forces. JUAN GONZALEZ: And Ari Rosmarin of the New York Civil Liberties Union, the implications of this for privacy rights and for civil rights? ARI ROSMARIN: Well, they’re very serious. One of the hard things about doing Know Your Rights education around this issue, both in New York but also around the country, is that advocates and communities have done a good job of educating people over the last now about seven years about No Child Left Behind and what the privacy implications are there, but what folks often don’t realize is that, coming out of that, there’s also this massive program that’s funded, obviously, as David talked about — billions of dollars that go into a whole range of recruitment efforts of — towards getting information about young people through myriad different ways that mostly they have no idea is taking place. So there’s a danger when, for example, a student will turn in an opt-out form, which maybe will get to — which keeps you out of — your school from giving your information to a recruiter under No Child Left Behind. Meanwhile, the military has six other ways of getting that information, so that there really has yet to be a meaningful, comprehensive way to keep your information away from military recruiters, which is, you know, unprecedented. JUAN GONZALEZ: And how can parents opt out, if they want to? ARI ROSMARIN: Of the JAMRS database, it’s actually, unfortunately — there is a way, but they make — they want to make it very difficult for you. According to the Pentagon, the only way to what they call opt out of the database is for your parent — a student cannot do this his or herself — a parent needs to send a letter to the Pentagon, asking the Pentagon to take their student out of the list. And even then, you’re not removed to the list — from the list; you’re put into what’s called a suppression file, which is a separate list within the JAMRS system and database system that keeps you away out of that list, but you’re never really removed from the list. JUAN GONZALEZ: Now, there’s a lawsuit against the JAMRS database? ARI ROSMARIN: There was. In 2005, the New York Civil Liberties Union filed a lawsuit against the Pentagon, charging them with violating a couple different laws, the Privacy Act and the Defense Act. 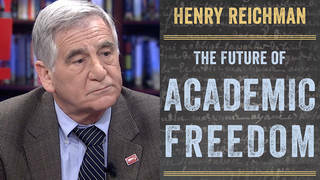 Basically, the military was putting information into this database and keeping it in certain ways that were in violation of the law, including keeping information on students as young as fifteen in the database, when the law only allows seventeen and over; keeping it for longer than three years, they’re keeping it for five years; collecting Social Security numbers — a number of different things. And that lawsuit ultimately settled, and we were successfully able to keep the military from — keeping it for only three years, stopping collecting Social Security numbers, clarifying opt-out information, clarifying the privacy regulations. But interestingly, the one thing that — or one of the main things that we wanted, but the military refused to give in on, was the collection of racial and ethnic data. And that’s something that is not called for under the statute, but the military felt it was so important that they keep racial and ethnic data in the database that they pushed hard and refused to give in on that point. And when you look at the — at enlistment numbers, the two factors that are the clearest indicators of who’s going to end up in the military are racial and ethnic data and college plans. And so, the military is certainly thinking about that when they do their recruitment. JUAN GONZALEZ: And, David Goodman, could you tell us about the use of video games by the military in their recruitment efforts? DAVID GOODMAN: Two —- yeah, two of the main videogames being used by the military. One is a video game that the Army itself has created. It is called “America’s Army.” Amazingly, one in four males between the age of thirteen and twenty-four have played this game. The new version, “America’s Army 3,” was just released in June. And users who play it are, the Army says, 29 percent more likely to be interested in serving in the military. So this one is actually created by the Army. JUAN GONZALEZ: And is it — and it’s available free online or what? DAVID GOODMAN: Free online, yes. Another is “Halo 3,” which is a hit Xbox game. It has sold more copies than the Harry Potter series. The Army spent over a million dollars to sponsor “Halo 3.” And it has links. This is a Microsoft game but has links where players can link out to the goarmy.com recruiting website. So these are some of the other ways that the military is going. But, Juan, I did just want to follow up on this question of what can concerned parents do. JUAN GONZALEZ: Yeah, we have about thirty seconds. Yeah, go ahead. DAVID GOODMAN: OK. And that is that around the country, the ASVAB test is being administered in many high schools, and this is used by the military for recruiting, for placement in the military. And many students and parents are trying to get that test out of the schools, because it’s mandatory in many of the schools where it’s administered. So that’s a very important piece of activism that has been going on. JUAN GONZALEZ: Well, I want to thank both of you for being with us. Ari Rosmarin is the senior advocacy coordinator at the New York Civil Liberties Union, and David Goodman is a contributing writer at Mother Jones magazine. We’ll link to his website — his article on our website.